Samsung is leading in ‘phablet’ series into the market and the success of their previous models tells everything without keeping any doubt. However it is also a fact that they have to work really hard to maintain their success as many other makers are trying to capture the market share to increase their customer base. 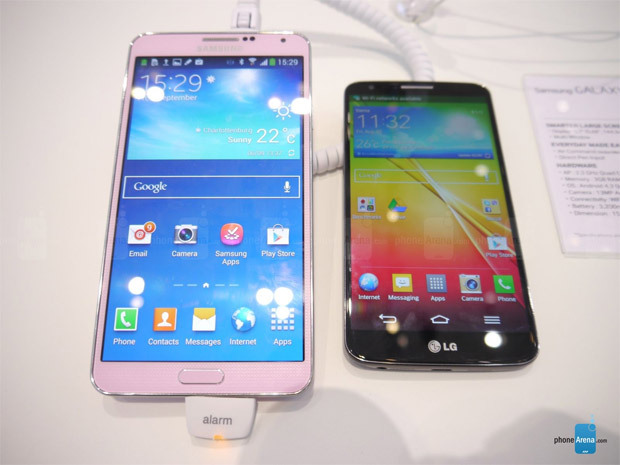 One of them is LG and they have recently brought their new ‘phablet’ G2 which is also very powerful and stylish. It explains that Samsung may have to face a big competition in coming times which will be highly interesting to check. Here we are discussing the details of both these models which can help you to choose your next smartphone. The dimensions of Samsung Galaxy Note 3 are 151.2×79.2×8.3 mm. It weighs 5.93 oz and you can use S Pen Stylus here like previous Note models. This smartphone has an elegant 5.7 inches Super AMOLED capacitive touchscreen that has the power of 1080×1920 pixels. It has the pixel density of 386 ppi. Now if we talk about LG G2 then the gadget has True HD-IPS+LCD capacitive touchscreen. Screen-size is 5.2 inches and the resolutions are 1080×1920 pixels. This multitouch model has the pixel density of 424 ppi. The display of this model is well-protected with Corning Gorilla Glass 2 protection. You can use the latest operating system Android version 4.3 JellyBean in Samsung Galaxy Note 3. Quad-core processor can work with blazing speed without any difficulty. Moreover Adreno 330 GPU and Qualcomm Snapdragon chipset are highly supportive. Humidity, temperature, gesture and many more sensors work effectively here and internet can be accessed with the help of HTML5 browser. Dropbox capacity of this model is 50GB. LG G2 is based on Android version 4.2.2 JellyBean operating system. This model is also loaded with a quad-core processor and you can utilize Qualcomm Snapdragon chipset and Adreno 330 GPU here. Samsung model is available in Pink, White and Black color whereas LG model is available in Black and White color. Primary camera of LG G2 is 13MP. It has many useful features like geo-tagging, LED flash and face detection. Video power is 1080p @60fps and secondary camera is of 2.1MP. Samsung Galaxy Note 3 also contains a 13MP of primary camera. The power of this camera is 4128×3096 pixels. Features like LED flash, face and smile detection, HDR, panorama, and dual shot make the device highly useful. Secondary camera is of 2MP. Samsung Galaxy Note 3 has an influential 3200 mAh Li-Ion battery. However LG G2 has a non-removable 3000 mAh Li-Po battery. It is one of the main sections to check. The price of Samsung model is around $850 only whereas the price of LG G2 model is around $788.89 only. Both the models are offering high class connectivity options with latest Wi-Fi options and Bluetooth connectivity. You can check both the models now with ease and select your option as per your choice.